AUSTIN, TX. 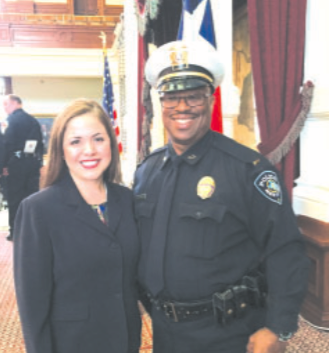 Sept. 10, 2015 — Governor Abbott awarded the Star of Texas Award to 28 Texans, including Jacinto City’s recipient Lt. Dennis Walker. Since 2003 the award recognizes peace officers, firefighters, emergency medical first responders and citizens who assist them killed or injured in the line of duty. Walker was injured March 20, 2013 when he was shot while defending another JC officer who had also been shot. “What impacted me this day the most was my having seen those family members and the little children of those who was killed in the line of duty. It tore my heart out to see those kids get the award for their deceased parents. Seeing that took me back to the day of the shooting and it made me realize those kids could have been my own,” Walker said. Jacinto City officials and citizens traveled to the State’s Capitol to watch the Governor’s presentation of the award Thursday morning. 14-year-old Janecia Chatman, left, and 17-year-old Mariya Johnson, right, died last Tuesday morning on their way to Furr High School when their school bus was hit and flew off the 610 South Loop. HOUSTON – Two young girls are dead, and two other students and the bus driver are recovering after a tragic accident on the South Loop eastbound Tuesday morning. At about 7 a.m. in the morning, the Houston ISD bus was taking four students to Furr High School, when it was struct on the left side by a car that entered its lane after trying to avoid a third car that was encroaching on it from the left, also. The bus veered to the right, and hit a guard rail on an overpass, went through it, and plunged about 20 feet to Telephone Road below. The bus landed on its roof, crushing the side and roof so that emergency exits were necessary to remove the injured passengers. 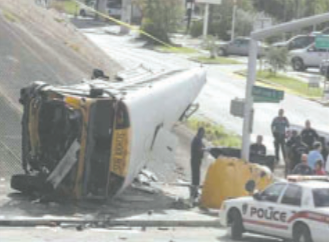 The Houston ISD school bus was eastbound on the South Loop, when a car beside it pulled quickly into its lane, causing the bus to swerve to the right, hit the guard rail, and plummet to the frontage road below. 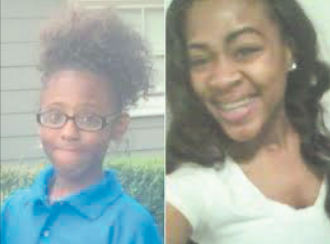 17 year old Mariya Johnson died at the scene, and 14 year old Janecia Chatman died at the hospital. Johnson was a Reach Charter School student, which is at Furr. Chatman was a freshman at Furr. Recovering at Texas Childrens Hospital are twins Brandon and Lakeisha Williams, students at Reach. The bus was equipped with seat belts, but it is not known if they were used. The bus driver is Luisa Pacheco, a driver for the last 3 years for HISD, with a clean driving record. She is recovering at Ben Taub hospital. No charges were filed to date for the accident. Also being investigated is the guard rail, which reportedly did not meet current TxDOT standards. THE SAN JACINTO PILOT CLUB, at their regular monthly meeting, swore in two new members. 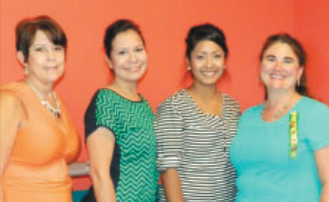 Pictured, from left, sponsor Karen Westbrook, new members Sara Garza and Natalie Martinez, and membership chair Julie Fallin. Also made an honorary member was Star Publisher Gil Hoffman. NORTH CHANNEL – The San Jacinto Pilot Club held their regular monthly meeting last Thursday, a luncheon at Gatti’s Pizza on Sheldon Road. The meeting opened with remarks from president Joan Van Fleet, and motivational moments from Julie Fallin. The club decided to pay for a memorial brick at Cam For All, in Burton, Texas in honor of deceased member Pat Cooper. Upcoming projects were discussed. It was decided to participate in providing helmets for the bicycles that are given away each holiday season by Mr. Fat Mac in Baytown. Mac refurbishes donated bicycles and donates them to needy children each year. The San Jac club will donate $7500 for 150 helmets. It was noted that Mac actually gives away about 500 bikes every year. Another project the club will participate in is a “Trick or Trunk” on Halloween, Saturday October 31st. 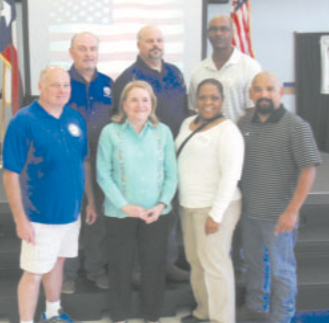 State Senator Sylvia Garcia poses with program participants at the First Responders Appreciation Dinner. CHANNELVIEW – The Channelview Ministry Team held their 3rd Annual First Responders Appreciation Dinner, last Saturday evening, Sept. 12 at the Barrett-Lee ECC Building on Sheldon Rd. Participating in the ceremonies and awards were representatives from local fire and EMS departments. Guest Speaker was Mr. Dale Jenkins, HFD. Also speaking was State Senator Sylvia Garcia. Welcoming remarks were by Greg Ollis, Superintendent of Channelview ISD.